I’m back to preparing for spring workshops, as I have several elementary schools I’ll be visiting. I find I must begin several months out – gathering the materials, finishing some edges (ie. hachi maki or wall hangings), or putting them in “kit” form. I also often need to make samples or just need to “play” and practice with some of the forms, as with kite making. In the past, students have had several days to make them, so my approach has been slower and much more complicated. I’ve recently found that it really wasn’t necessary. In this upcoming series, in April, students will have roughly 45 minutes to put them together and perhaps add an image to the sail. So, the approach has changed and I like it so much more. I’m looking forward to further experimentation, working with other materials and I might even fly a few. On the whole, this school year was an experiment to see how things would sort out in terms of numbers and what I could handle. It was my first year away from the classroom and really had no idea what it would feel like working as a teaching artist on a more “full time” or at least working with a full calendar – that is, responding to every school that called. In this case, on the average I had at least one/month and some were whole school (300-600 students). I’m finding already, that I overbooked and that it’s physically challenging. If I was younger it would be a different story perhaps. However all of that is, I’m reassessing approaches to the activities I offer (including my current springtime workshops) and the number I take on (as well as the numbers of students involved) in the next school year. It’s a learning process for sure. Another thing that I also think about is my personal studio time – prepping takes away from it and it affects my own work, my attitude and ability to approach it at all sometimes. When I’ve had the time for it, things flowed, I felt creative and it basically affirmed that’s where I really want to spend my time. This year though, things were a bit out of balance, so finding that is going to take some fine tuning. I made it clear to at least one of my 3-4 assistants today that shibori and indigo dyeing is not really the intense and frenzied experience it felt like today at some points. This image also doesn’t honestly reflect the few hours I spent at Artspace this afternoon. None of the pictures I took really captured that essence. I’d arrived later than I’d wanted (of course), as on the way down realized I didn’t have an important ingredient for the “soup” and had to stop for it (good thing it came to mind). Of course, that took a few precious minutes. My concern always is, when I set up for indigo, the time factor. Indigo needs time to work properly as it seems to be temperamental or sensitive (it really does seem to be “alive” at times). It has to be nurtured. So, I was under the gun but it responded well in that creative environment and we had a nice potent vat. Then the kids and families started drifting in for this hands on Japanese tie/dye experience. The kids bound 12-inch cotton squares with rubber bands or glass “pebbles” to make simple patterns that received a quick dip in the indigo. It was a too brief encounter with the experience but they seemed to thoroughly enjoy it. Before I knew it, we had lines and it felt a bit frantic as my assistants and I hurried to open their bound pieces and put them in bags to carry home. The pace never really slowed until it was time to stop and quickly clean up. In spite of the seeming craziness, it was a lot of fun and the kids and parents seemed to be very appreciative. Arigato to all who contributed to its success: assistants, Lia & Artspace. This little girl waited patiently until finally, today I gave permission to paint or color in their kite images. The most difficult task for them was to make the frames, which included my having them draw up a grid on which they would place their dowel pieces. There were a lot of sticky fingers and it required a lot of patience from all of us to get past this point. It could have been asking them too much, to cut the patterned edges of their kite skins for final attachment today. They walked through it though and finished their pieces in good time. They had time leftover to play games or draw. I’ve been teaching another “Mukashi” class at Artspace this summer. It’s only for this week. I wrap up my part tomorrow. We’ve started every class with a folktale or part of one, or a story relating to topic. I think they’ve enjoyed it. I would have thrown in a song or two, but the class next door (we’re separated only by canvas curtains) was one in cut glass mosaics. There was a lot of grinding, cutting and pounding so that aspect of things seemed unwise. Apart from that, the students put their focus on their tasks and seem pleased with their results. This weekend in downtown Raleigh several streets around Moore Square close down for Artsplosure, a big crafts festival. There are a lot of events going on in the galleries and museums in the area at the same time. One of the displays at Artspace is the instructor’s exhibit for the art camp starting in June. My jackets are included in this show. If we have enough enrollment, I will be teaching a class that includes gyotaku and kite making for 3rd – 5th graders. A workshop in shibori is also planned for high school and college prep aged students. I’m hoping enrollment will increase so that we can do this. I enjoyed doing it last year. In April last year, my J2 class made kites. I needed to learn how to teach the process and they needed to make something. It was spring after all. It was warm outside and in last quarter. We were also in trailers which meant we had no sinks or running water nearby. I brought it in gallon jugs, and we had more than enough. They were provided with all of the materials: sumi paper, dowels (cut to size), glue, paintbrushes and string. They began with constructing the frame of a small Edo kite, then laminated (glued 2 layers) their paper before attaching it to the kite. The last thing they did was paint their images. The process took a lot longer than I’d planned, but the outcome was worth it. I should also mention, that along with the creative side of this was a language packet appropriate to topic with vocabulary lists and other little “goodies” included. One significant aspect of this project for me was that the massacre at Virginia Tech had just taken place. With two of my own in college, I was more than unnerved. In the end, I was the one who needed a change of pace. These kites must have been my first foray into surface design. I was doing an independent study at Meredith College, trying to maintain studies there while teaching Japanese. My instructor was collaborating with the 3D design teacher in one of her classes, so these pieces were the result. What I remember is that I had to have a project and I was running out of time. I think I was lacking in inspiration as well, feeling desperate with my inability to create and teach at the same time. In the end, this little collection wound up being part of a student exhibition in the administration building. Much later, when applying for United Arts and pondering the different things I could teach kids, this was one idea that a friend suggested and I’ve been building on that idea since. This particular piece is made up of page sized kites that loosely referenced Edo kites. Each piece was manipulated in some way with a different kind of surface design. Some were dyed, then stamped or stenciled. 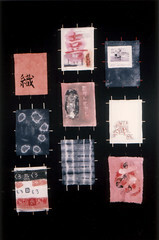 Others had different types of photo transfer including printing by computer. Two others were shibori. When I teach it I use paper and the students make fairly traditional looking Edo kites. I suppose one of these days I may have to try it with textiles.